Michael McGraw: Hello, All Crab Apple Image Searchers! Hello, All Crab Apple Image Searchers! Welcome! 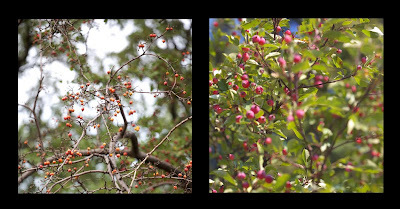 I know you have been looking for images of crab apple trees. Perhaps trees with red fruit, or trees with thorns. Well, you've found them. A third of all people who come to the website are looking for Crab Apple Tree images. I don't think many of you are actually looking for art photographs of crab apples, so leave a comment and let me know what you were really looking for. Thanks for stopping by. Check out the archive. I've got a lot of crab apple photographs.